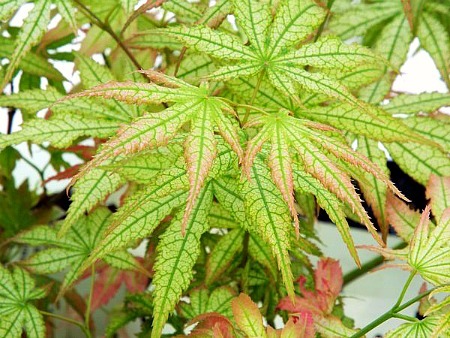 Peaches and Cream is a Japanese Maple with white based leaves with dark green veining. Ends and tips change out to reddish shades and remain throughout the summer months. Speaking of summer months, the Peaches and Cream does require protectin from hot afternoon and evening sun, otherwise leaves have a tendency to burn. Matures in the 6 to 10 foot height over about 10 years. Orders shipping to CA or AZ addresses will be bare rooted and root washed before being prepped for shipping.